Yes, there is a Petaling Street in Melbourne. Only it's not really a street - it's a restaurant. 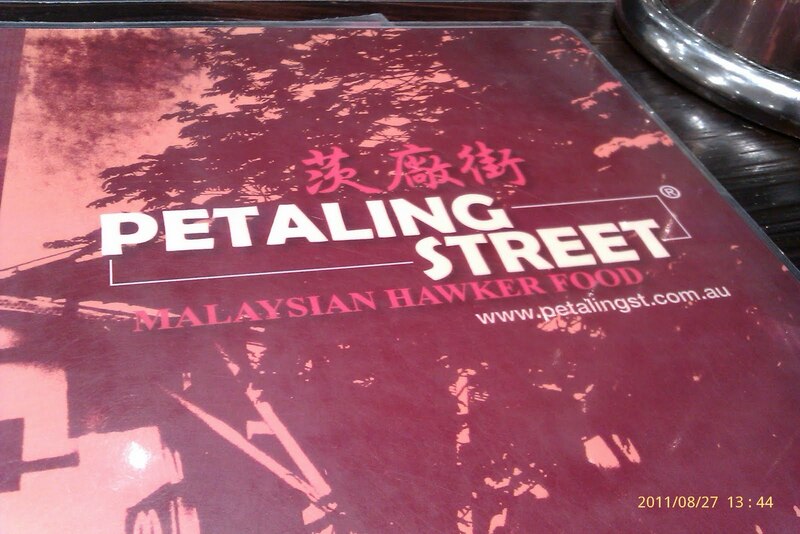 o_O And they serve Malaysian hawker food (Petaling Street is actually a street in Kuala Lumpur). Decided to check it out - it's been open for a few months and every time I walk past it, it is packed. The interior is very typical of a working-class Malaysian restaurant. The wooden stools and tables packed closely together further enhances the buzz and rush of the place. It is quite well-ventilated, with a high ceiling, so you won't have to worry about your clothes and hair smelling like food when you leave the place. And as you walk in, you can see the kitchen staff at work preparing and dishing out the food. Got the 'roti kosong' to start ($4.90). It was served with some curry on the side. 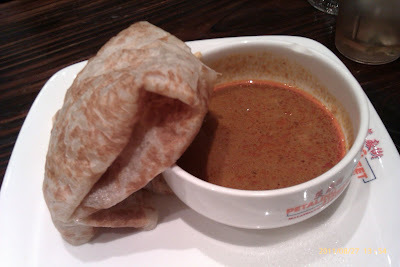 The roti was nice and fluffy, and the curry was pretty yummy too. Wasn't feeling like eating noodles so I ordered the Fish Fillets in Nyonya Sauce with Rice. I love rice - any kind except the soggy kind. The dish was really tasty. Not mind-blowing - nothing compares to real Malaysian food in Malaysia. But this stuff was pretty good by Melbournian standards. The sauce was tangy, just a little spicy, and a good balance of flavours. 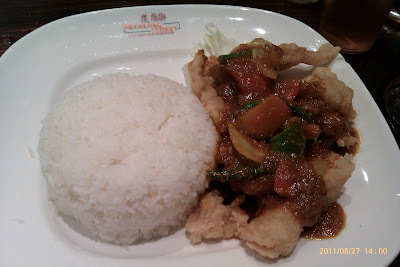 The deep fried fish fillets were nice and crispy on the outside, and soft on the inside. For a dish that costs $10.90, I can't complain. 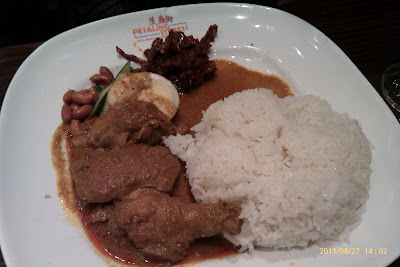 Suvrat ordered the Nasi Lemak Special with chicken curry ($10.50). Nasi lemak is an iconic Malaysian dish that I grew up eating. I used to have it practically every day when I was in school. I LOVE it! Especially the kind that comes wrapped up in a banana leaf and sold by the roadside :p The version at this place came served on a plate - no dramas. But the presentation was haphazard - not good. The reason why I love nasi lemak so much is because it really is the best blend of tastes and textures - the crunchy peanuts, the crisp and fresh cucumber, the softness of the egg, the salty fried anchovies, the sweet and spicy explosion of flavour that is the sambal, and that lovely coconut rice. Can I say again how much I love nasi lemak? While the sambal, chicken curry and coconut rice at this place were pretty good, I've definitely tasted better nasi lemak. In conclusion, I did not love this nasi lemak. But it was Suvrat's dish anyway - and he didn't complain too much about it. We also ordered drinks - I ordered the Iced Bandung and Suvrat ordered the Iced 3 Layer Tea. 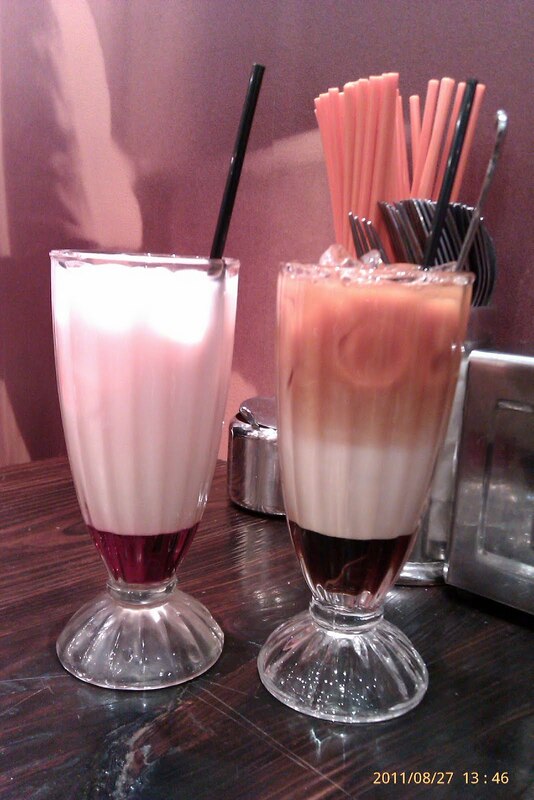 The Iced Bandung is basically condensed milk and rose-flavoured syrup, diluted with some water. It was very sweet, maybe a bit too sweet. But I really like the combination of the creaminess from the condensed milk and the rose flavour from the syrup. Suvrat's drink consisted of a layer of milk tea, a layer of evaporation milk, and a layer of palm sugar syrup. He said it was good. I didn't try it, so I can't compare it to the other 3 layered teas I've tried.